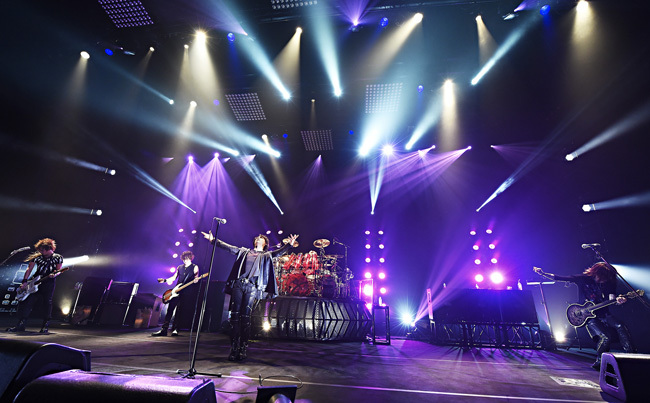 On February 28th and March 1st, 2015, LUNA SEA began wrapping up their much celebrated 25th anniversary live tour “THE LUNATIC – A Liberated Will -” at Tokyo International Forum Hall A. 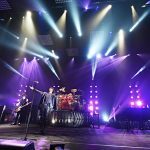 The rock band celebrated yet another significant milestone in their career with fans, kicking off their nationwide tour on May 29th, 2014, followed by a total of 35 lives at 16 different prefectures which stretched into March of this year. The tour final was held 2 weeks after this show at Osaka-jo Hall on March 14th, 2015. 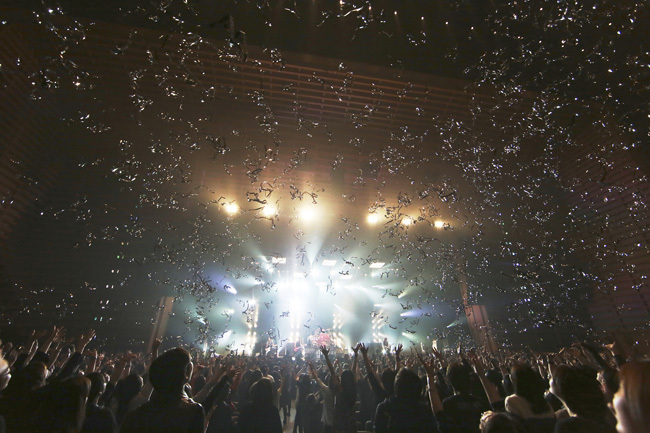 On the clear night of March 1st, excited fans gathered at the modern hall which was clearly much, much too small to contain LUNA SEA’s vast amount of passionate fans that each one must’ve felt like they won the lottery to have acquired a ticket for this sold out live. This was evident when the lights went down at 6pm and blue lights lit the stage. 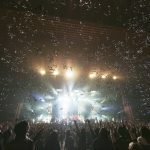 As the band’s familiar SE music, “月光” (Gekkou), blasted through the speakers, everyone from the crowd jumped to their feet – along with deafening claps and cheers – literally shaking the entire venue. Fans went wild as the members appeared on stage one by one. The immense impact gave me goosebumps and it was an all body experience of a lifetime. The first song was surprisingly not their more recent album “A WILL“, but instead the upbeat classic “Dejavu“. The crowd jumped to the rhythm as pink and blue lights lit a simple stage set with a large white fabric screen hung in the back. J switched places with SUGIZO, who was jamming with INORAN to the left. Fans reacted excitedly to the members driving the crowd, heating up the venue at once. 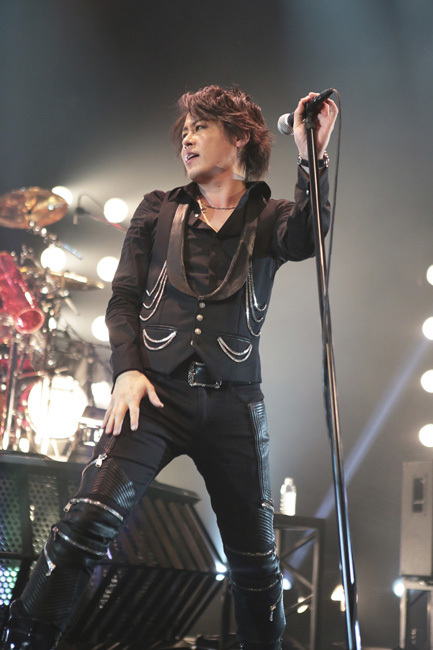 Ryuichi pointed his microphone to the crowd to sing the third verse, and the fans sang in perfect unison. The explosive energy had me confused for a second – is this really only the first song and not the last song? If the first song is like this, what crazy thing will happen for the rest of the night?! Shinya‘s powerful drums at the end of the song pulled me back to reality. 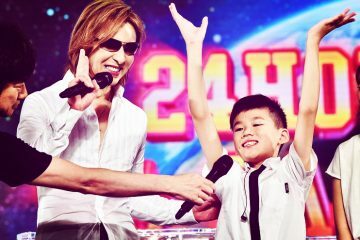 “TOKYO!” Ryuichi prompted the crowd several times, who responded by loud “OHH!! !”s before heating up the venue with the even more fast paced rock number, “PRECIOUS…” Everyone threw their arms into the air. Ryuichi interacted with SUGIZO center stage, with more singing-along before entering the last set of chorus and ending with SUGIZO‘s wailing guitars. With that, the band started “DESIRE“, their hit single from 1995. Lit by red and green lights, a mesmerizing ripple can be seen on the backdrop. The fans went crazy when Ryuichi put his arms around SUGIZO during the guitar solo. The temperature continued to rise as the song transitioned into “JESUS“. 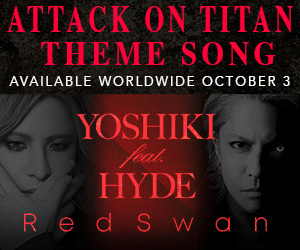 Shinya‘s powerful yet playful drum beats blasted through the intro, joined by SUGIZO‘s guitars then the rest of the band. The backdrop dropped to reveal four sets of red lights similar to dominoes at the back of the stage. The rhythm of the song makes everyone can’t help but headbang along. Fans cheered loudly for J‘s groovy bass solo which smoothly transitioned into SUGIZO‘s guitar singing melodiously for the solo. The song ended feverishly with red lights flashing as the whole band sang the outro together before ending with a big bang. Then, a heavy smoke screen arose as a heavy drums x bass intro paved the way for the groovy yet mysterious sounding number, “FACE TO FACE“, a song from their 1994 hit album “MOTHER”. The crowd appeared to be happily taken by surprise by the band’s choice of playing some older tunes for their set that night. Ryuichi‘s melodic yet haunting voice glided over the howling guitars and the heavy rhythm section, making our hearts beat to the rhythm and sent a slight tremble through our bodies. After the MC was “乱” (Ran), the first song they played that night from “A WILL”. Beautiful vocals, singing synth line, melodic bass, light but solid drums, and soaring guitar solo weaved together a scenery that was in much contrast to the title which translates to “disarray”. As the song faded out with screeching feedbacks, the crowd also quieted down. 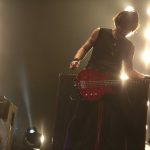 Shinya cued 1-2-3 on the drums and the venue was filled with a green hue as INORAN led the classic love ballad, “Gravity“. Each and every one of their parts tugged on the heartstrings of listeners, myself included, bringing back bitter sweet and slightly sad memories of the past. Fans were visibly drawn into the song, some with tears streaming down their faces. The crowd went from sadness to excitement for the mysterious sounding “SANDY TIME“, a song on their self-titled album released back in 1991. Next, we were treated to an instrumental jamming session. SUGIZO was now lit by a stream of purple light from above, armed with his electric violin. Fans cheered his name loudly before he continued onto a haunting yet emotional violin piece. He was then joined by INORAN playing with a slapping beat on the acoustic guitar. 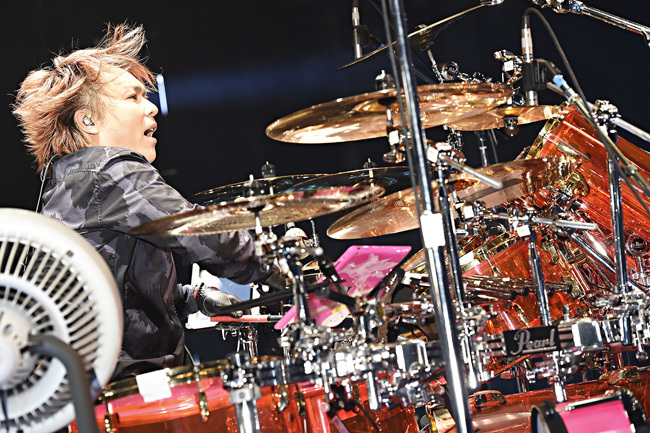 They increased the rhythm and Shinya joined in at the latter half with his powerful and charismatic drumming, eventually leading into his mad drum solo. He suddenly paused and the crowd held their breath. He lifted his arms up and the crowd began chanting his name. Looking satisfied, he continued drumming up a storm while occasionally provoking the fans through his microphone. The other four members reappeared on stage for the upbeat song, “Be Awake“, performing at the edge of the stage to drive the crowd. The members ran around, INORAN and SUGIZO played back-to-back for the guitar solo, and the drums ended the song dramatically. Strobe lights flashed, setting the mood for the fast paced “Metamorphosis“. Ryuichi‘s headbanging, Shinya‘s explosive and impressive-as-ever footwork and SUGIZO‘s shredding solo were definitely memorable. Following the song, J took over the stage with his overwhelming charismatic bass solo performance. “Tokyo!! Together! COME ON! I can’t hear you! !” He provoked the crowd while playing center stage. The members reappeared onto the stage and stirred up a “STORM” inside the venue filled with over 5,000 fans. 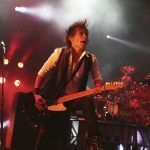 The band was never short of interaction with each other, with Ryuichi putting his arms around SUGIZO‘s shoulders during the guitar solo, or INORAN and J jamming together while grinning from ear to ear on the other side of the stage. As the night was nearing climax, there was no stopping them with “ROSIER” up next. The crowd actively waved their arms to the rhythm and sang along. J ended his English section by flipping his mic stand high into the air towards the back of the stage. Not to be outdone, Ryuichi knelt on the floor, leaning towards SUGIZO‘s guitar as he was playing the solo. All the members then moved around to provoke the fans, who responded with jumps and fist pumps. Then with a surprising change of tempo for the last song of the main set, a music box music intro led to “absorb“, an emotional upbeat power ballad from “A WILL“. It was a very touching song to watch, with everyone holding their arms up swaying to the rhythm. I’ve came to understand that for a band as legendary as LUNA SEA, every song is simply a classic, and that every one of their songs is as good as the other to be the first or final song of their set. I snapped out of my trance as the lights in the venue brightened up for the outro and big smiles on everyone’s faces as they sang along became visible. This whole scene filled my heart and soul with so many feelings – both as a musician and as a fan – that I cannot even begin to describe it in words alone. All I know was, I found myself beaming so much my cheeks were a bit sore, and it really might have also been my fever, but it was such an amazing set so far I already forgot I was sick. “Thank you very much! 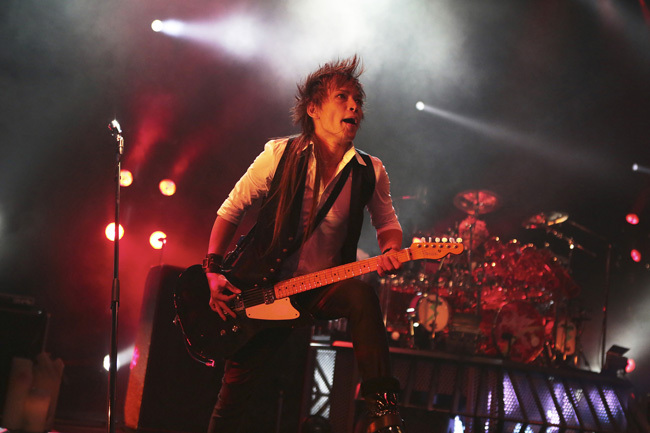 !” Ryuichi thanked the crowd and left the stage, followed by J, INORAN and Shinya. SUGIZO threw a bottle into the crowd before also exiting the stage. After not even 10 minutes of encore call, Shinya and INORAN once again came back onto the stage, followed by Ryuichi and SUGIZO, both pairs with arms around each other’s shoulders. Ryuichi also came out holding a large white cloth with fans’ messages written all over it. J ran out last and threw a band towel into the crowd stage left. SUGIZO took another towel that he passed around for each member to wipe before throwing it into the crowd. Ryuichi tried to drape the large white cloth in front of the drum platform but when it slipped down after a few attempts, he began to fold it up. “Ehhhh???!! !” The crowd protested, and so this time staff also came out to help hang it up. “Did you guys notice there’s a face hidden in the roses on the T-shirt? It’s a secret.” When fans began checking their shirts, Ryuichi said playfully, “Actually, it just happens to resemble a face. (laugh)” He continued, “Aw, I don’t want this to end. How about everyone change their residency to here? Rent will be quite expensive here though. (laugh) Let’s all have a drink together some day. 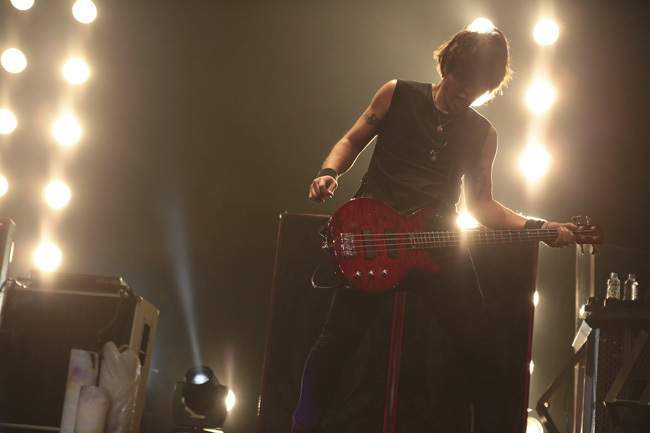 With that, INORAN took center stage for the first encore song, “TONIGHT“. It was a delight to finally be able to hear this live, as it was a song that brings back a lot of great memories for me. I’m sure there were many who share this feeling for many of their other songs on this night. The crowd burst into an even louder cheer when INORAN ran down the ramp on stage right to drive the crowd. Everyone was jumping and singing along happily. Silver streamers exploded when the drums came in for the intro of “WISH“. INORAN started playfully hitting Shinya‘s cymbals as he was playing guitar besides him, while all the other members ran around the stage. 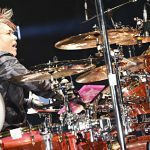 The entire venue sang “lalalala” together during the quiet section backed only by the drums, the unity at that moment was simply unbelievable – correction, I’ve come to realize anything is actually quite believable at a LUNA SEA live, because seeing is believing. “I’ll introduce the members!” With all I said above, I did not expect a band of their caliber to do a members introduction at an anniversary live, let alone a 25th anniversary live! LUNA SEA sure knows how to keep things exciting. “I’ll start!” Ryuichi then continued in English phrases: “I am~?” “Ryuichi!” “We are~?” “…LUNA SEA!” “…You all hesitated for a bit, didn’t you?” Ryuichi retorted in Japanese before thanking the fans, “Thank you so much for showing us such an amazing time this tour!” He continued on to introduce J, INORAN, and SUGIZO, who yelled “I love you guys! !” Lastly, “Drums!” Ryuichi yelled. The crowd yelled back “SHINYA!!!!! !” After a few times, Shinya came down from his platform to center stage, kicked the mic stand and said, “On Twitter, I saw that we have haramaki (stomach warmers) goods, you should get them ‘cuz they’re REALLY warm. (laugh)” The crowd laughed and then he started conversing with them in English: “I LOVE YOU!” “OK!” “I’M FINE, THANK YOU!” Which caused the entire venue to erupt into laughter. For the final song, “Grace“, a large mirror ball descended from the ceiling, bathing the venue in a glistening light changing from purple to blue to silver as we were swooned by Ryuichi‘s graceful voice for the emotional ballad. All the stage and house lights were turned up for “Anthem of Light“, filling the venue with feelings of light, love, and hope. 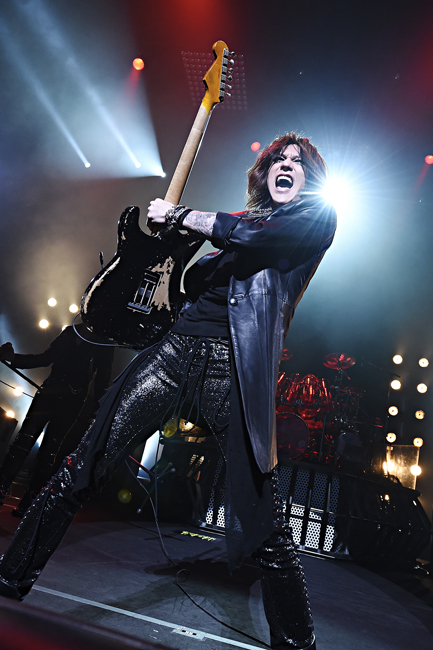 A few times, SUGIZO pounded on his left chest then pointed to the crowd emotionally to convey his feelings. “Everyone together!” Not only through actions, but it was clear to see that the bond between the band and fans are stronger than ever. The audience was clearly in shock to the word “pause”, and clapped with mixed feelings. Before exiting the stage, each member greeted the crowd with a final message. INORAN, “Surely….Surely we’ll meet again. See you guys on March 14th!” J said in English, “Tokyo! Goodbye!” Shinya, “I love you guys! 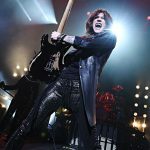 Good night!” SUGIZO, with a slightly sad and reluctant look on his face, stayed behind last and bowed deeply for a long time to loud cheers and claps from the crowd before finally waving goodbye and exiting the stage. 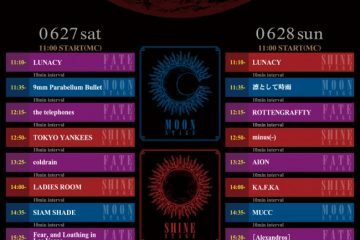 While fans must’ve felt shocked at the band’s announcement, with the final live wrapped up and the band announcing that they’ll be hosting LUNATIC FES. 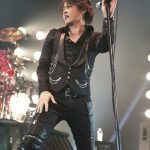 on June 27th and 28th this year, fans must also be extremely excited to see what surprise LUNA SEA has in store for them at the rock fest they claim to be “the craziest rock fest in history”. Although the artist line-up hasn’t yet been announced, both days will feature 11 other artists besides LUNA SEA so it’s definitely something you’d want to stay up to date for! I also realized my fever went down that very night after the live. These guys’ music sure is magical.